That's the big problem with parachute-assisted landings.. you can't use them in a cross-wind. And castoring landing gear adds a whole other dimension of complexity. He still did a great job for the first landing! I'm sure the Conroy Virtus has come up before in this thread, but it would have used a pair of B-52 fuselages. I would think that Virgin Orbit would be more likely to buy the plane/company. They may need a bigger plane if they want to scale up Launcher One (or WhiteKnightTwo for that matter). Northrop Grumman is pursuing Omega which I think will keep them busy and preoccupied for many years to come. Not a bigger plane, as LauncherOne is still quite small (57,000lb) for the 747's carrying capacity (upwards of 200,000lb). If Virgin wanted to air launch something double or even triple the size, the 747 is still an option with much more extensive modifications than they've done to date. Possibly quite expensive, but much simpler than Stratolaunch and there's a glut of surplus 747s being retired. Clearance under wings maybe more of issue with 747 with larger LVs, also off centre load. Virgin would need to see how airlaunch works out for LauncherOne. If they did decide Roco could for them with larger LV, it would be few years away. I was thinking of changes equivalent to those of the Shuttle Carrier Aircraft or the TriStar used for pegasus launches. LauncherOne achieves 500kg LEO using a retired commercial jet with minimal modification. I'm using very "finger in the air" numbers, but an air launch carrier for a rocket capable of up to 2000kg is probably possible using a 747 within a budget of tens of millions, and they're plentiful, cheap and well supported. The problem for the StratoLaunch, is that it's a solution for rockets carrying payloads of as much as 6000kg at a cost of hundreds of millions with the complex lifetime support issues of a bespoke aircraft. I doubt there's the necessary combination of capital and use case amongst any commercial launch operators, but something may happen if costs are written off. The Antonov also has a range of over 8,000 nautical miles and can land at most major airports, against the forecast range of just 2,000 for Stratolaunch. It's a plane built for a very specific and singular role, which is also literally the aircraft's name. If there's a cargo role, it's going to be some very specific site to site function rather than general purpose. Tonya, in case you are interested they recently found a second AN-225 that could be completed. I wish they would, amazing aircraft an another piece of Russian space history! ..although it seems from the video that landing the thing is kinda interesting, even in zero wind. Yep (eek!) If that is a landing in good conditions, this will be very tricky to land in any decent crosswind. But it is possible the slo-mo or telephoto made it look worse than it was. The comparison with the Spruce Goose always sounds a little unfair. At least on technical grounds. the Spruce Goose was technically flawed in the sense it used piston engines and a wooden structure, plus a flying boat, in 1947-48, which were all relics from before WWII. It was also seriously underpowered considering its size and mass and drag. At least Stratolaunch isn't dangerous to fly nor underpowered. On technical grounds, it is a sane aircraft. I think Ukraine have been finding the unfinished second AN225 for about twenty years now! I can't remember the source, but I saw a story once that put the prospects of it ever being completed quite starkly. The cost estimate was in the same range as building four new AN124's, and there just aren't that many unique payloads that need such a massive plane. The single plane they have is only very sparsely used, and is often in its hanger for months. There's a lesson there in terms of the economics, and it was a much more versatile aircraft than Stratolaunch. Allow me to say some kind words for the Hercules (Spruce Goose). It was designed to save lives for troop transport at the time where there was heavy losses from ships being sunk by U-Boats. Wood is “natures composite” and was an excellent non-strategic material for aircraft construction and fatigue resistant. The de Havilland Mosquito was one of the fastest propeller fighter/attack aircraft and had a low radar cross section because of it being wood composite and stealthy. The Hercules being a flying boat meant that there was no need for vulnerable runways from enemy attack. Recall that the early jets were under-powered had a short operational life compared to the reliable propeller engines at the time and continued on such as the B-36 and in commercial aviation even after the arrival of more modern jets. Flying boats continued to be developed post war for a time with jet power as they became more powerful and reliable. Other famous aircraft have flown once and never again. But I’m hoping there is more to the program than “fly it once for Paul Allen”. I agree. Although the Spruce Goose was intended for carrying troops and tanks across the Atlantic in WW2, the Stratolaunch rocket launch platform is for peacetime purposes. The opportunity will rise for Stratolaunch to fly again when it is used for a rocket launch. The problem is that AN-225 really isn't seeing much demand. Certainly not enough demand to build a 2nd one. And Stratolaunch is much more limited to very large airfields with a wide enough runway. 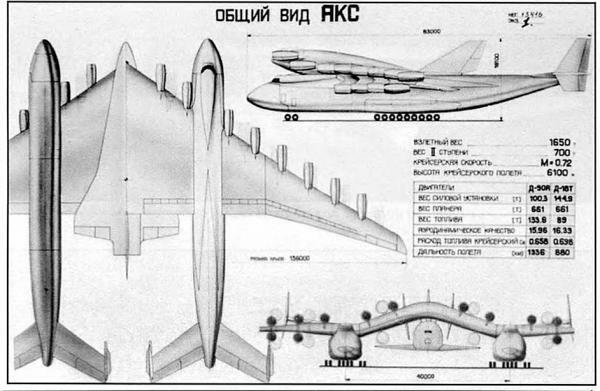 But perhaps they will find some niche where this works where the AN-225 doesn't. "Build it and they will come" works sometimes, but often not. When this project began, SpaceX had only launched two Falcon 9's, and had only just announced the Falcon Heavy and Reusable Falcon 9. If those projects hadn't panned out (more the latter) this could potentially have been a viable avenue for a reusble SSTO rocket. Now however, the market has shifted so much that Stratolaunch has been left behind. By the time they are flying small expendable rockets, if they do, they will be competing with the likes of Falcon 9/Heavy and New Glenn on the big end and the Electron and LauncherOne on the small end. If they don't start launching soon, they will look antiquated next to Starship/Super Heavy and any justification will be gone. When this was announced, it could have been great assuming things had stayed the same, but the world has changed so much. I don't recall ever seeing that image, in this thread or elsewhere. 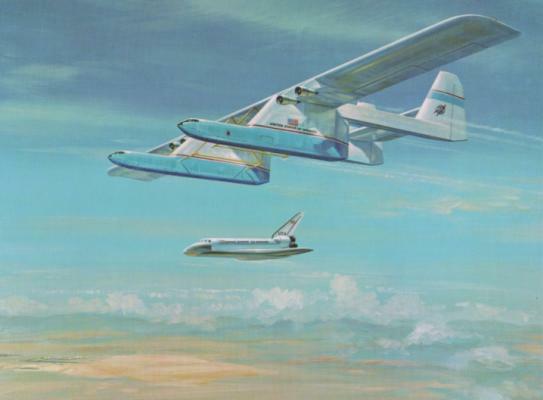 It does bear a remarkable resemblance to Stratolaunch, in a mid-20th century way. A Google search on "Conroy Virtus" turns up a bunch of different images, with different fuselages, wings, engines, and cargo pods. From 4 to 14 engines. How do all of these different designs relate to "Conroy Virtus"? Note that in this image and most the tails would have been linked with a totally interior rear wing. Always wondered why that was not the choice for Stratolaunch. It would seem to limit the torque on the center bridge wing, but that's the difference between armature guessing, artistic license, and engineering. I believe they're just different concepts from Conroy while developing the idea, the image I shared is the most well known and likely final version after wind tunnel testing. I only heard of the plane via the Vintage Space channel on Youtube, which usually focuses on space history from the 60's. Regarding Stratolaunch, this interview revealed that Burt Rutan did want to link the fuselage at the back... and also put the cockpit there in the middle. 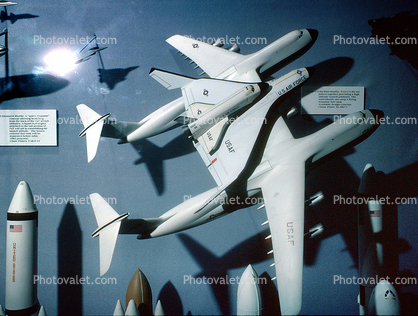 This was probably inevitable, but after briefly wondering if anyone considered something as ridiculous as a twin fuselage Antonov 225, I found they did. The blog itself notes the lack of primary source, so take with a pinch of salt. The last thing you want is to build cargo-specific fairings and tail cones. If you want this to be halfway cost-effective, you have to build a large, universal cargo container a.k.a. an airplane fuselage. Relatively cheap maybe, but still on the order of tens of millions of $. It's too bad that after canceling their own rocket development there are no appropriately sized rockets for this to launch. I know it won't happen, but I'd like to see them put some wings on Vega C and air launch it.